Saturday nights in NYC just got hotter!!! 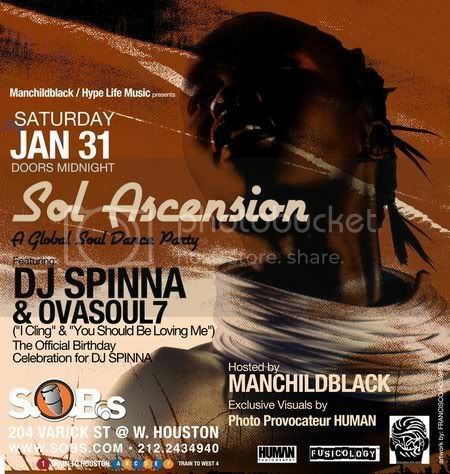 Legendary nightclub SOB'S and recording artist/promoter of the popular Libation party, Manchildblack, bring you a night of global grooves with their brand new dance party, Sol Ascension. This monthly soiree is dedicated to showcasing the best live acts and dj's in the genres of global soul, afro-beat, funk, deep house and nu jazz to keep you dancing all night long! On Saturday, January 31st, Sol Ascension will celebrate the birthday of one of the music world's true anomolies, producer/remixer/label owner DJ Spinna. The Brooklyn based legend is world renown for his incredible production on songs like the Shaun Escoffery anthem "Days Like This", his critically acclaimed genre defying albums Here to There and InterGalactic Soul, and his enormously popular tribute parties to musical icons like Stevie Wonder, James Brown, Prince and Michael Jackson. If that weren't enough, the nights stunning slide show exhibit will be provided by photo provocateur Human.